Financial independence is as much about the journey as it is the destination. And while we are still years away from arriving at our intended destination of FI, we have a plan for both the journey and the destination. This post will focus heavily on the FINANCES of achieving financial independence. But before we get to that, there are two essential clarifications to better understand our approach to FI. First, this plan is NOT written in stone. Let’s face it, life just isn’t that simple. 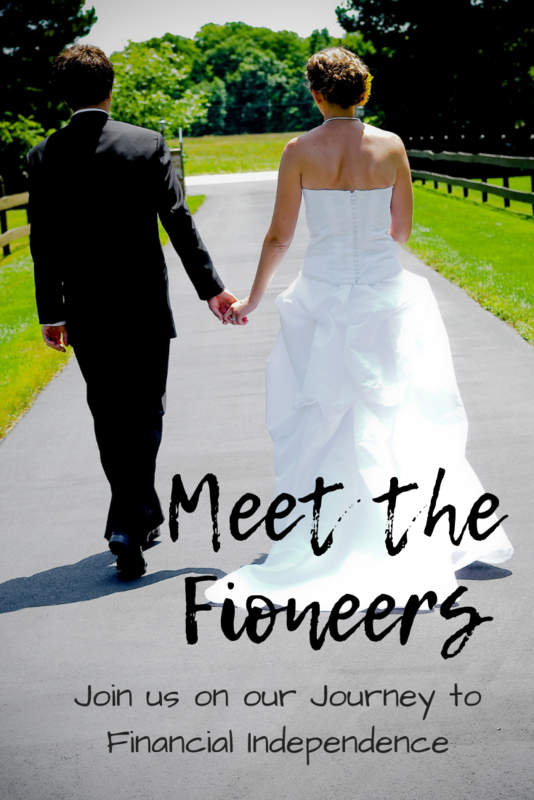 We learned this lesson the hard way just months out of college and weeks after we got married. Three weeks after we got married, Jess and I moved to Nicaragua to teach English. We intended to stay there for at least a year, only to return 6 weeks later, each of us twenty pounds lighter after three life-threatening bouts of various illnesses. Needless to say, life did not go as planned. And we learned that the hard way. Plus, the only thing that I know that is written in stone is a tombstone, and I’m not done living yet. Writing a master plan that wouldn’t change over time would be like writing our tombstone. I’m not in a rush to do that, but I did have a little bit of fun with some free tools found on the internet. See below. Second, our plan is also NOT the shortest route to financial independence. 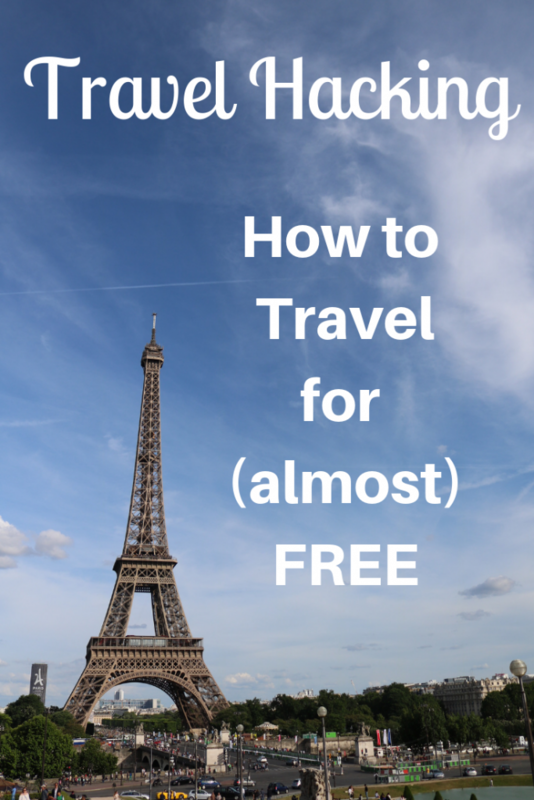 Imagine you’re planning a traveling vacation with the primary goal being to have an adventure and to see new sites. How do you go about this plan? Do you pick the shortest route to go from site to site, or do you plan it out with stops and detours to make the most of the trip? I think hope everyone is likely to answer the latter. Yet somehow not everyone takes this approach when pursuing financial independence. Too often FI narratives are filled with words of endurance, often suffering at a job that they hate, only so that they can enjoy life later. 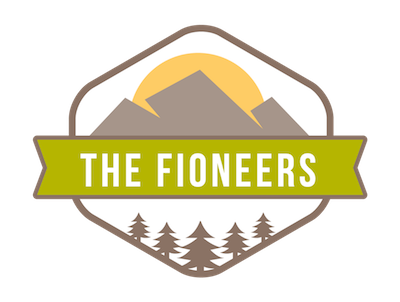 In these stories, these fioneer pretenders are so focused on getting to financial independence (as some mystical destination), that they forget about the journey to get there. These individuals not only lose sight of the lifestyle that they hope to create after reaching FI, but they run away from it. These stories can still be inspiring. But what this typical approach fails to anticipate are the sudden life changes that are likely to come when they reach financial independence. People who think that lifestyle changes can happen with the flip of a switch, making sudden leaps from one phase of life to another, are sorely mistaken. There are moments to make drastic life changes, but my point is that often these notable changes are filled with smaller decisions along the journey. Our plan to reach FI is not to deprive ourselves to build up a nest egg so that we can relax later. 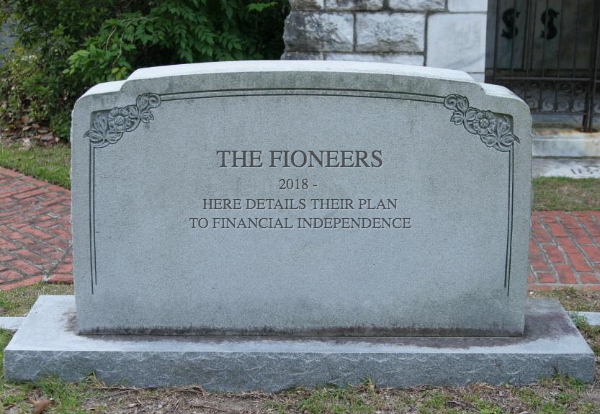 And to be clear, our journey to financial independence is not about early retirement. We are not looking to not work or sit on a beach for 50-60 years. Instead, this journey is about lifestyle design, freedom, flexibility and security. We plan to take very intentional actions so that we can adjust our lifestyle along the way. Here’s a detailed look at what our plan currently looks like. Our Baseline: Where Are We Starting From? 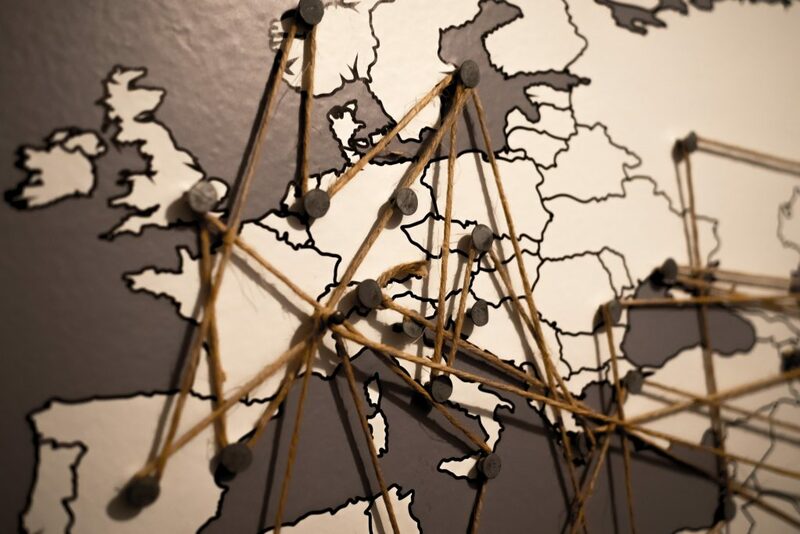 Before we jump into HOW we will achieve financial independence, it’s crucial to better understand WHERE we are now, or from where we are starting our journey. Thankfully we have jumpstarted our pursuit of financial independence with intentional lifestyle decisions, so we are not starting from zero. That’s not to discourage others from doing the same thing – it just means that we have been saving a few years. Age: We’re both 31 years old. Assets: We currently have 4-5x our annual living expenses currently invested in the stock market, excluding equity in our home and additional cash reserves. Savings Rate: We currently save 57% of our take-home pay. 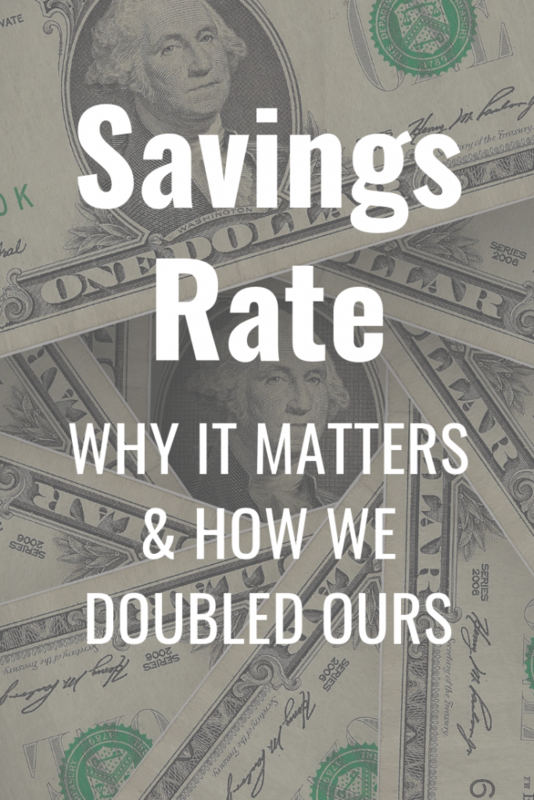 We’ve rapidly increased our savings rate over the past few years. FI %: We can currently cover approximately 15-20% of our annual expenses indefinitely by using the dividends and appreciation from and without depleting our assets (using a 3.5-4% safe withdrawal rate). Based on our current savings rate and assets and a few other assumptions about market performance, we will reach financial independence in 11 years. Assuming we make no changes to income, expenses, etc. This is our baseline. In other words, if we continue earning what we are earning (with no annual increases), saving what we are saving for another 11 or so years, and see an average 5% growth after inflation, we will reach financial independence in 11 years. While ~11 years may sound like a long time, let that soak in a little bit. We could be financially independent in our early 40s. That’s incredible! We have a high savings rate. We’re a dual income no kids household and we are both currently earning pretty good salaries (especially for nonprofit employees). We’ve minimized our expenses through many strategies that we’ll go into detail in a future post. This is why being able to be financially independent by my early 40s is so remarkable. We aren’t that unique or special. Yes, we have some privilege that has given us a headstart, but there are so many areas that we have not optimized from a purely financial standpoint. My point here is that as cliché as it sounds, I think so many more people could achieve the same thing. Our Plan to Reach FI: to quicken the pace to reach financial independence while aligning our values with our spending. Again this ~ 11-year window is our baseline, and we are just getting started. We have a lot of life optimization still to do. Both are important to achieving financial independence, and while both are distinct strategies, they are related. Let’s dive into each to better understand what we will do to achieve FI. The definition of cash flow is the difference between income and expenses. In other words, it’s income minus expenses. As many may know, you can have a negative cash flow if you are spending more money than you earn. OR do both. This is our plan. We plan to both increase our income while also decreasing our expenses. Now, this is easier said than done, but we’re excited to do so while not feeling like we are depriving ourselves of any value or satisfaction. Decreasing our expenses helps us two-fold. First, it allows us to save (and invest) more money, which will contribute towards our other goal of wealth accumulation, but more importantly, it lowers the amount we need to save to reach financial independence. I’m going to say that again because this is critical to our success. By learning to live on less, we will not only have more money to build up our nest egg, but we will require a smaller balance to consider ourselves financially independent because the nest egg will have to fund a less-expensive lifestyle. Here’s a visual of what I am talking about in the context of our financial independence plan. 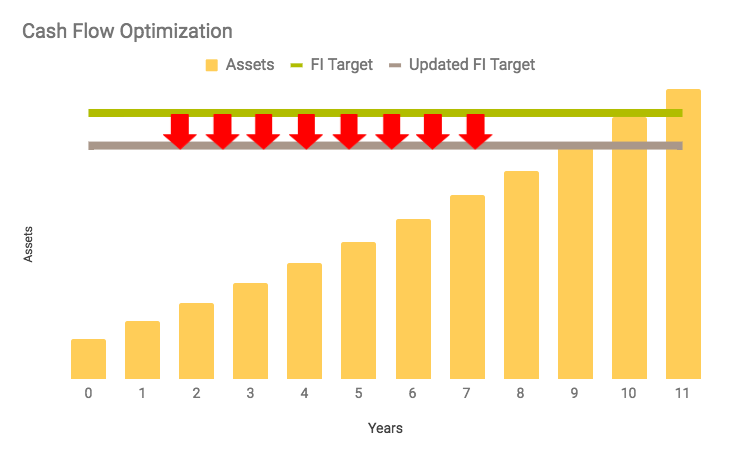 By decreasing our annual expenses by even $10,000, not only will our assets grow at a faster pace to allow us to hit our original target 1 year earlier than our baseline, but the target decreases so that we hit our updated FI target another year earlier, in year 9. 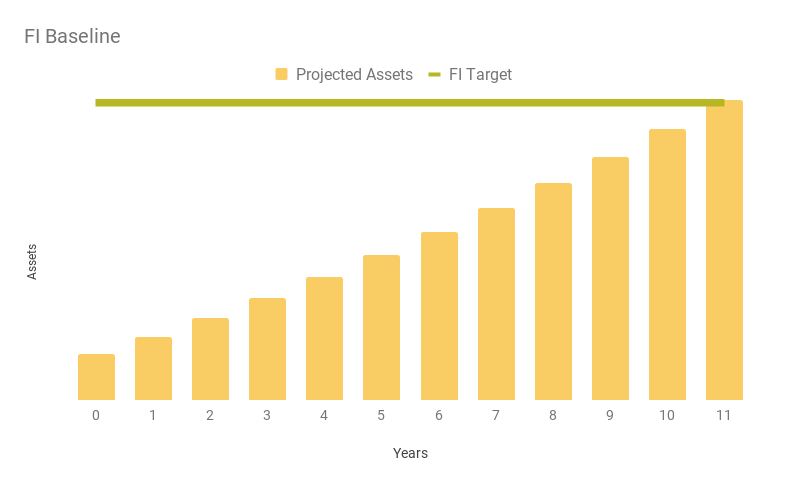 While these are just projections and the actual years to reach FI will fluctuate based on many unpredictable variables, the importance of decreasing expenses remains. Not everyone can decrease their annual expenses by $10,000, but we’re confident we can achieve this with a few basic tactics to eliminate some of the recent lifestyle inflation. 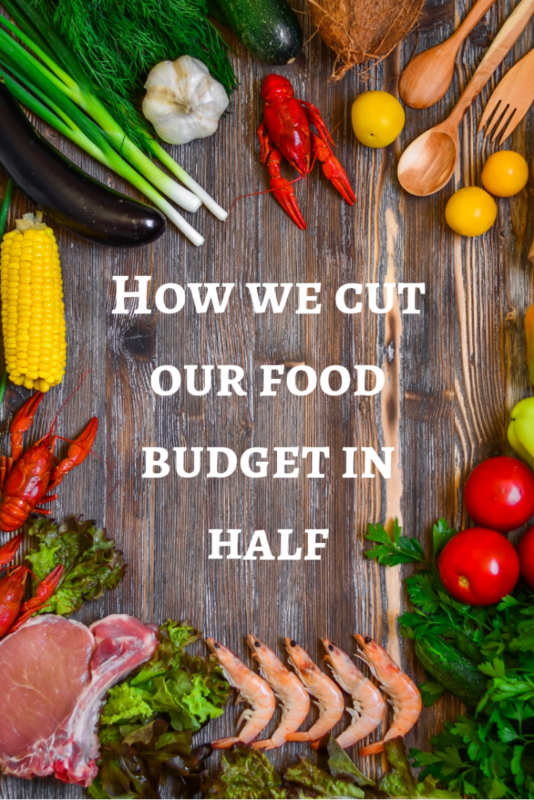 Note: while we’ve begun to lower our expenses, we’re still learning how to cut the fat from our spending without sacrificing enjoyment so this list will likely grow over time. We’ll be sure to update this plan as we identify other quick tactics to maximize enjoyment and minimize expenses, but again, we’re just getting started. The other side of optimizing cash flow is increasing our revenue. While this won’t have the same dollar for time impact on our path to FI, this is also critical to our success because the potential is limitless. While we can only decrease our expenses so much, there are theoretically no limits on how much money we can make. Once you remove the mental barriers and stigma for earning more money, you’ll be amazed at what you can do. Increasing our income will allow us to save more money and again, will also help our focus on wealth accumulation. Let’s give an example. Imagine, using the most recent example (after decreasing our expenses by $10,000), that in the next two years, we found a way to increase our annual income by $20,000. This may seem like a lot, but this is less than $2,000 per month. Here’s what it would do to our timeline. 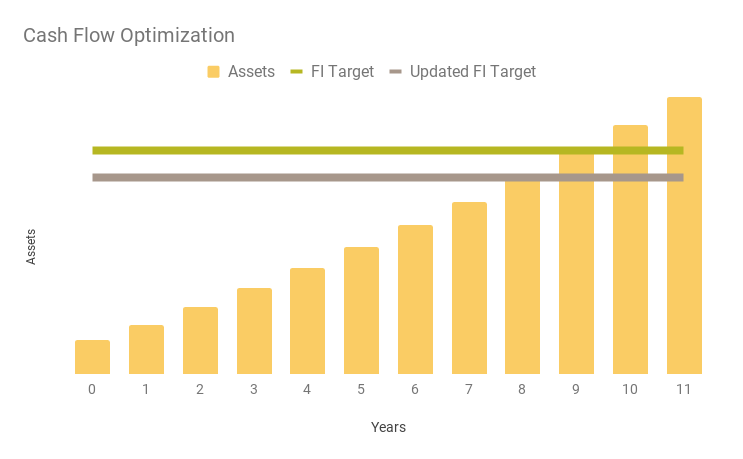 While it may look like the FI Target and Updated FI Target decreased, this is not the case. The dollar amounts represented with each of these lines stayed the same. The yellow bars, representing our wealth accumulation grow at a faster pace. This is intuitive. The more money you earn and can save, the faster you can build wealth. Earning and saving an extra $20,000 after 2 years cuts off another year from our journey to financial independence. We’re not limiting our mindset to increase our income by only $20,000 (we could increase our income by a lot more than $20k/year), but it does help illustrate the power of earning more money. *Note: Real estate income, as we will detail in a future post, helps in a couple of ways. It gives us additional income, of which we can throw into the stock market or various other expenses, and the income it provides is “passive income”, which will continue as long as we hold the properties. This means that in theory, we could lower our FI target even further. It’s too soon to tell to determine how much money we will make from real estate, and how well we will do. For now, we will leave it as it is and update it along the way. The other side of our path to financial independence is wealth accumulation. As we already discussed, we plan to grow the gap between our income and expenses so that we can increase our savings rate even more and ultimately grow our net worth at a faster pace. While our cash flow is the aspect that will have the most substantial impact on increasing our net worth, there’s still more to do. Similar to increasing our cash flow, I’m sure there will be other items that we optimize in the wealth accumulation tactics of our plan to FI. We’ll be sure to update this list as we pursue our journey. Some may confuse wealth accumulation as the end goal or the destination. Many early fioneers target having 25-28.5 times their annual expenses as the goal, some even using charts or graphs to represent their progress toward that goal. While we may embrace this metric as a financial definition of financial independence, this is not the end goal for us. 1 – There is actual work to be done. Wealth accumulation is not just a result, it’s an activity. To achieve the goal of financial independence, we have to optimize our wealth accumulation (as we outlined above). It’s not enough to sit back and watch our net worth increase, we have to do something about it. This is why it’s part of our plan to get to financial independence, not financial independence itself. 2 – There’s more to life than money. As I mentioned in the introduction to this post, financial independence is about living. It’s about the freedom or security to choose. If we focused solely on the FI number, we’d miss the point of FI in the first place. For this reason, our destination of financial independence is more about lifestyle design than it is reaching a particular number. While we are embracing some of the financial independence frameworks (25-28.5x annual expenses) as a target, there’s still a lot of uncertainty around what our life will look like years from now. This is why we think financial independence is both a journey and a destination. Figuring our ideal lifestyle is our frontier – both the journey of optimizing parts of our life while buying our freedom and the destination. And that’s exciting and motivating all at the same time. This idea that financial independence is more than a number is hard to articulate well at a conceptual level, so here’s a concrete example of what I mean that may better illustrate my point. We are aiming to quicken the pace to FI through the strategies outlined above, but again it’s not written in stone. We may decide that we’ll value having more time to pursue passion projects now than to continue working full-time to save and accumulate wealth at a faster pace. 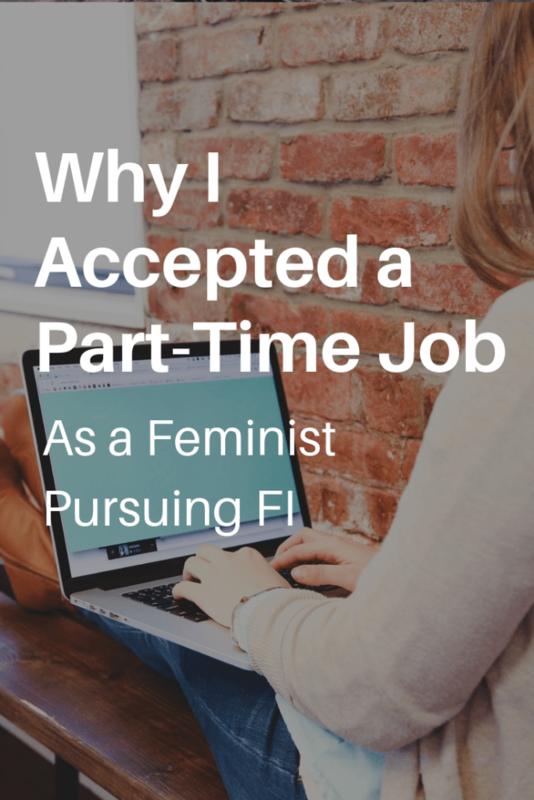 Even as I write this, Jess (aka Mrs. Fioneer) is considering working part-time so that she can dedicate more time to side projects (including building out more value and content for our readers here). On the surface, this may seem counter-intuitive, but again, our path to financial independence is not the shortest path from where we are now to a future number. The reality is that we don’t know yet what will make us happy years from now. We’re going to do a lot of experimenting and testing lifestyles to see what works for us, and we will share with you the progress along the way – both regarding numbers and in what gives us the most significant value. Isn’t it cool that you are able to think about FI as a reality and have retiring in your early 40s as a possibility? Especially since most people never heard of the concept of FI or RE until just a few years ago. Congrats! Yes, it is really cool! I am still really amazed sometimes that this is a real possibility. I wish more people knew it existed (i.e. 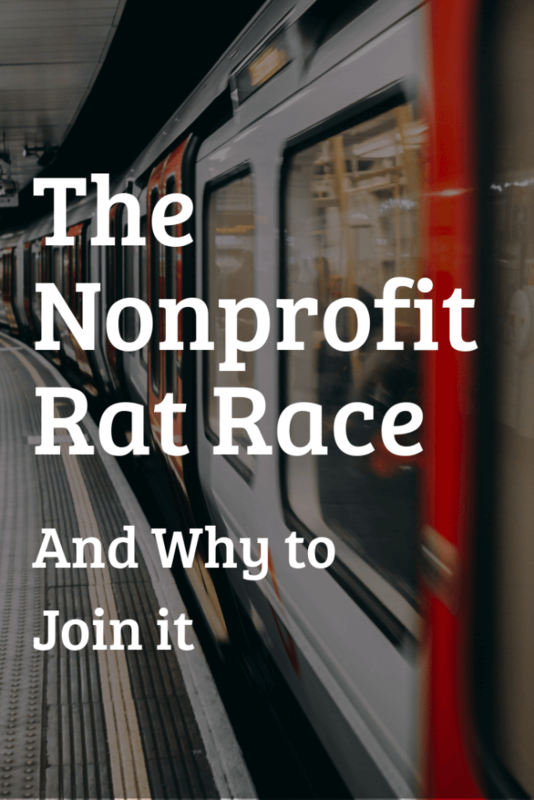 part of why we created this blog! )!